A. THIAYAGA RAJU proved passion and patriotism are very much alive. 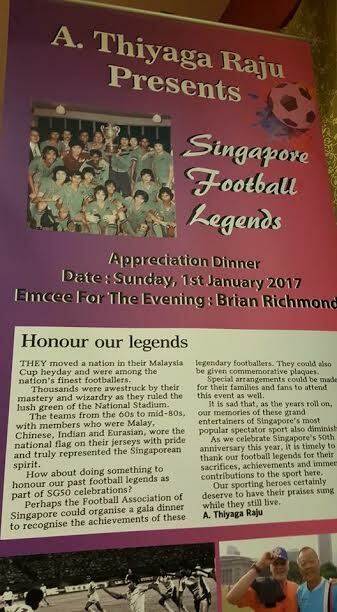 The 55-year-old, who has been a fan of the Singapore national team since he was 12, forked out S$8,000 (RM25,000) to organise a “Singapore Legends Appreciation Night” on Sunday at Ceylon Sports Club. Thiayaga is not a wealthy person nor was he seeking publicity. What he did was a genuine gesture and for the love of Singapore football and his appreciation to players who brought glory through the Malaysia Cup. Thiayaga recalled: “I became a fan on Sunday May 26, 1974. “I went to National Stadium for the first time to watch Singapore play Penang in a Malaysia Cup first leg semifinal. “I was 12. When my friends and I arrived at the stadium, we saw thousands of fans climbing the stadium gates and high walls. “We did likewise not knowing we were entering the stadium illegally. There were about 70,000 fans inside (capacity was only 60,000). “Fans risking limb and life to watch Singapore footballers amazed me. “Three years later, Singapore reached the Malaysia Cup final which they won 3-2 in extratime with Quah Kim Song bagging a brace. I started hero worshipping many of the players. Among those from that team present at the appreciation dinner were Kim Song, Roy Krishnan, Lim Teng Sai, Seak Poh Leong and family members of the late Dollah Kassim and Lim Chiew Peng. Thiayaga wrote a letter to newspapers asking for the legends to be recognised and honoured. Despite it being published, there were no interested parties. “Even more disappointing, the FA of Singapore did not respond,” said Thiayaga, who then decided to organise the dinner on his own. 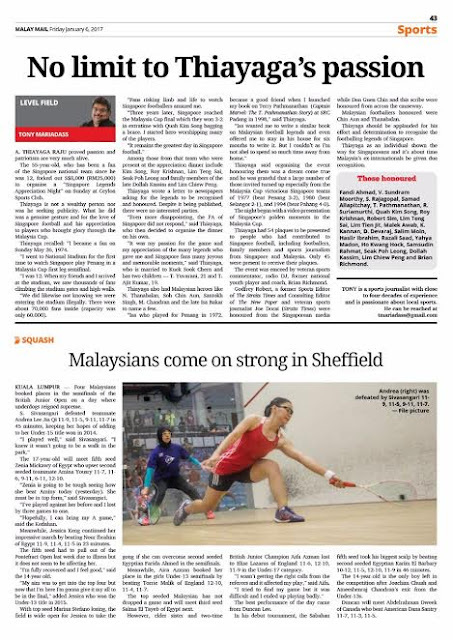 “It was my passion for the game and my appreciation of the many legends who gave me and Singapore fans many joyous and memorable moments,” said Thiayaga, who is married to Kuek Sook Chern and has two children — T. Yuvarani, 21 and T. Ajit Kumar, 19. Thiayaga also had Malaysian heroes like N. Thanabalan, Soh Chin Aun, Santokh Singh, M. Chandran and the late Isa Bakar to name a few. “Isa who played for Penang in 1972, became a good friend when I launched my book on Terry Pathmanathan (Captain Marvel: The T. Pathmanathan Story) at SRC Padang in 1998,” said Thiayaga. Thiayaga said organising the event honouring them was a dream come true and he was grateful that a large number of those invited turned up, especially from the Malaysia Cup victorious Singapore teams of 1977 (beat Penang 3-2), 1980 (beat Selangor 2-1), and 1994 (beat Pahang 4-0). The night began with a video presentation of Singapore’s golden moments in the Malaysia Cup. Thiayaga had 54 plaques to be presented to people who had contributed to Singapore football, including footballers, family members and sports journalists from Singapore and Malaysia. Only 45 were present to receive their plaques. The event was emceed by veteran sports commentator, radio DJ, former national youth player and coach, Brian Richmond. Godfrey Robert, a former Sports Editor of The Straits Times and Consulting Editor of The New Paper and veteran sports journalist Joe Dorai (Straits Times) were honoured from the Singaporean media while Dan Guen Chin and this scribe were honoured from across the causeway. Malaysian footballers honoured were Chin Aun and Thanabalan. 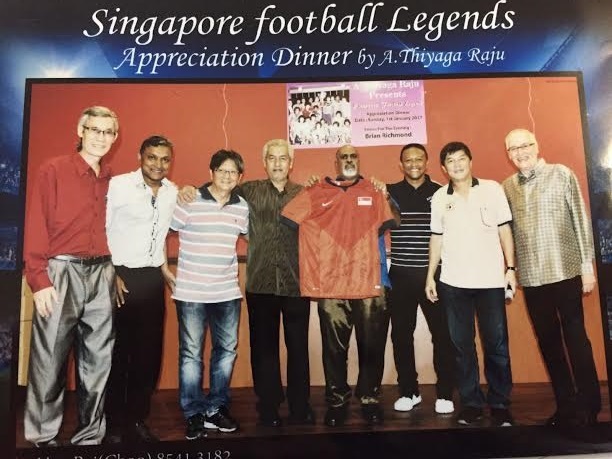 Thiayaga should be applauded for his effort and determination to recognise the footballing legends of Singapore. Thiayaga as an individual shown the way for Singaporeans and it’s about time Malaysia’s ex-internationals be given due recognition. 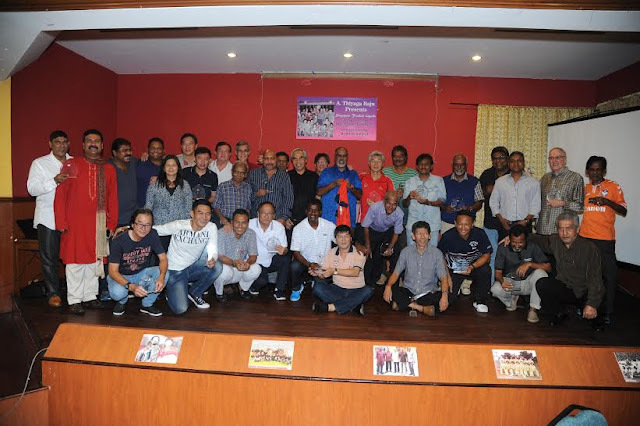 D. Devaraj, Salim Moin, Haslir Ibrahim, Razali Saad, Yahya Madon, Ho Kwang Hock, Samsudin Rahmat, Seak Poh Leong, Dollah Kassim, Lim Chiew Peng and Brian Richmond.